Posted on Friday, April 12, 2019 by "T". The XL Blizzard tournament runs from April 4 to 14, 2019 at 888poker with 34 events featuring over $1.7 million in guaranteed prizes and buy-ins as low as $5.50! Let's take a look at one of the events so far that concluded in the past weekend. The XL Blizzard #10 - $100,000 Tune Up took nearly 11 hours to finish and the one who emerged victorious here was none other than 888poker ambassador Chris "888Moorman" Moorman who won the first prize of $21,092 after defeating "Kroat" in a heads-up battle. The $160 buy-in event drew a total of 539 players plus 205 rebuys, which summed up to 744 entries. This created a total prize pool worth $111,600 with 72 spots in the money. Last year, Chris Moorman reached the symbolic milestone of $15 million in online earnings. The 33-year-old British poker player currently has total live earnings of $5.6 million, according to the Hendonmob. The XL Blizzard offers players high-value tournaments with various ways to win big in this series. With a total of 34 different games scheduled, players can participate in as many events as they can with buy-ins starting in as little as $5.50! If you don't like to shell out $5.50, then you can satellite your way in for just 1 penny! The main feature of the XL Blizzard series is the $500,000 GTD Main Event, with an affordable buy-in of only $250. Prize: Top 12 players will win a $250 seat to the Main Event. Prize: Top 30 players will win a $16.50 seat to the Mini Tune-Up Event. Another great thing about this is that anyone who joins in five tournaments shall be awarded a seat to a freeroll that will award four WSOP packages, three to the Crazy 8's tournament and one to the Main Event! Visit 888poker's website to view the full XL Blizzard schedule. 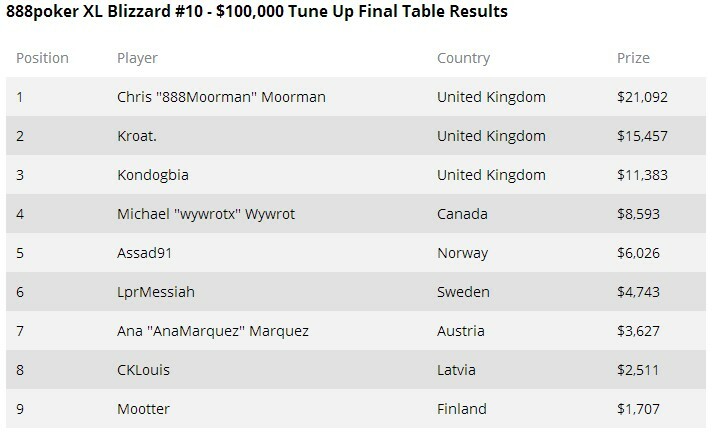 11 comments for "Chris Moorman wins $100,000 XL Blizzard Tune Up event at 888poker"
You cant say it is a tournament with a big buy in or a prize if that matters. And he is an 888 poker professional, so the glory stayed in the house by that win. Not a bad promotion for them. Nothing interesting here because to make a comparison we can say that: this series is very poor ( only $1 million and 700 k ), compared to 30 millions dollars of the Party Poker series. I do not understand this enormous difference because 888 Poker is a big room compared to others. Good game made by Chris Moorman if he managed to beat 538 players and to win this tournament. 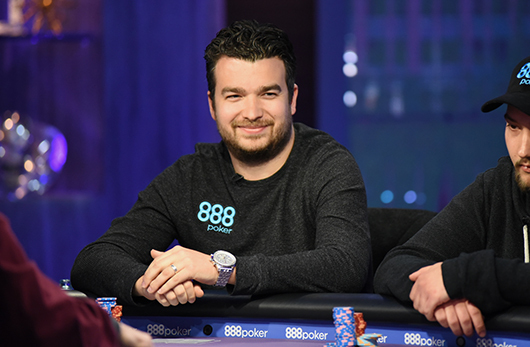 Very good results for ambassador from 888 poker chris moorman, it is not easy to record good score when you are big name, because very many people what to take your scalp. Hey this was a nice prizepool for a tournament with a size like this one. Somehow this aspect of the game gets overlooked when we supposed to celebrate results from similar sized tourneys (prizewise) which had ten times larger buyins for a start. The XL Blizzard is a nice promotion from 888poker and allows them to show off their new graphics, which I have to say i am not a huge fan of! Anyhow, the XL Blizzard is a promotion that many players can get into with the sate;;its structure at 888poker quite easy to navigate and get yourself into big games for little money. and we cans see this here from the various threads that are being posted all the time. a ticket with qualifiers, most of the times. Sure, the number of players is not very high but these players are not amateurs. I think Chris Moorman had a corridor much easier to the other players and of course when you are an ambassador, you have some advantages and that is a sure thing. This thing happens in all rooms.